Lucky Chaos would like to invite you to join the cast of the upcoming Lucky Chaos production of 30 Plays in 60 Minutes in Sept! 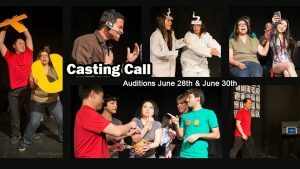 This is an all POC cast – looking for performers of color! Fixed rate (depending on experience), plus share of net proceeds. This show is one of our most popular shows and had sold out all its 8-show runs in the 3 years we did it. Two out of the 3 past shows had an all-minority cast, and the 3rd one had two non-POC in the cast. This one will have all POC as well. It’s fast-paced, audience interactive, funny and poignant. The order of the 60 plays are determined by the audience shouting out the number they want.